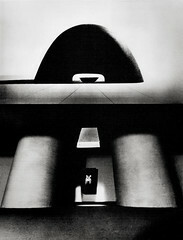 Model for Memorial to the Atomic Dead, Hiroshima (unrealized proposal), 1952. This image above is a composite of two photographs. In this version of the montage have modified the top and bottom photographs to align with one another, particularly the lines of the two massive supports below ground with the legs of the arch above ground. In addition, the horizon line has been straightened to be level rather than sloping toward the left. While these modifications of the montage are really quite subtle and don't change the essential idea being communicated, I've discovered several things about this memorial design that were otherwise obscure and unclear. You can view an image of the overall site design here. This image of the site model reveals what appears to be a trapezoidal shaped slot in the ground plane. I have struggled to reconcile the slot admitting light to the underground chamber with this presentation of the design and have struggled to understand the relationship between the arch, the slot, and the memorial block located in the crypt. Unable to resolve the seeming conflicting spatial arrangement suggested by the composite above and below ground image with the site model, I was only able to gain more insight into the design by breaking the two photographs apart. 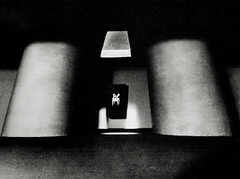 This approach to viewing the memorial design suggested itself to me when I recently discovered a Japanese publication of 1953 representing the work that Noguchi had assembled for exhibit there following his arrival there in June 1951. Winther, Bert. "The Rejection of Isamu Noguchi's Hiroshima Cenotaph: A Japanese American Artist in Occupied Japan". Art Journal, Vol. 53, No. 4, 'Sculpture in Postwar Europe and America, 1945-59' (Winter, 1994), pp. 23-27.